Most of you know me as Running Dutchie the ultra runner, but this wasn’t always the case. I sometimes have a difficult time convincing people that I’m not a natural born runner and that I too have had body image issues which still occasionally surface. At my heaviest, which was about 11 years ago now (2004) I weighed in at 98kg (15 ½ stone) and was a size 18 coming from living too much of the good life consisting of cooked breakfast most days, big lunches, snacks galore, 3 course dinners and wine every night. My only exercise consisted of walking the dog, during which I would buy an ice cream! I’d always been bigger, even at school I was never the sportiest, I used to forge notes from my parents to get me out of sports class! I never really realised I was fat until I was finding it difficult to buy clothes in regular shops and starting to look towards the big girls shops, it was then I took a good look at myself and realised things had to change as I wasn’t happy with myself like that. Don’t get me wrong I was happy in my life and had amazing love and support from Dion, my husband, who has never once said I was fat, well not then, he does admit now that we were both fat! I know that he loves me for who I am as he loved me then and he loves me now. Today I weigh in at 69kg (10 ¾ stone) and I am a fit, healthy & strong extroverted person that has a healthy respect for my body and I am happier than I ever thought possible. I know I’m not perfect but my big thighs power me up mountains, my broad shoulders allow me to carry a self sufficient backpack of 8kg across the Sahara desert and my reserves of fat keep me going through many a long distance ultra running race. It’s taken me a long time to develop this love of my body and I’ve spent many a night crying at myself in the mirror whilst clenching fistfuls of fat on my body desperate to be rid of it and then stress eating my way through chocolate afterwards to make myself feel better. What a contradiction right? I have managed to change that negative habit into going for a run to make myself feel better but occasionally old habits do come back and I am partial to making myself feel better with food, but at least now I know I have a way to wear that back off again through exercise. Before and after (2004-2015) – still the same big smile! I still sometimes think of myself as the ‘fat’ girl, the one with ‘big’ bones and an excessively curvaceous figure and can be very critical of myself when getting into a bikini or a tight number but my confidence has increased so much that these times are becoming less and less frequent and now more becoming a bold statement to happily show my bumps and curves as that is what makes me ‘Me’. My pet hate is people saying that I’m so lucky I can eat what I want and stay skinny. Firstly I am not skinny, I’m fit and healthy and secondly I can’t eat everything I want; I make conscious decisions daily to try and eat healthily and fuel my body correctly but I also consciously choose to eat cake when I want to or that pizza and beer, but know that I will have to work that off at some point too or no further gains will come in terms of fitness and strength if I eat all the wrong foods. But everything in moderation is my motto, I am here to live my life and I do find enjoyment in food, drink and the good times with friends that come with that and I am not prepared to give that part of my life up just so I can have a six pack (that has always alluded me!). 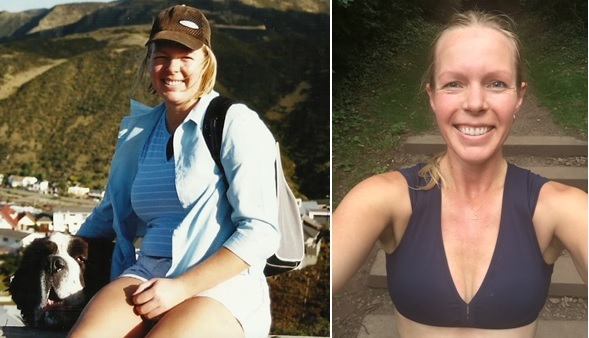 I wanted to share this with you to let you know that anything truly is possible; if I can turn to running and change my innermost feelings about myself then it is possible for anyone. We all have good days and bad days but always love your body for what it is and what it allows you to do and treat it with the respect it deserves and be happy. hi Ibet, can’t believe it’s been a year already! Wow! Get you doing such fantastic times, great achievement! Well done to you! Keep me updated with how you progress and enjoy San Fran! Like this post Dutchie! Excellent piece. Re these things one often feels all alone in this world until you hear a similar story about someone you so much admire…like I admire you. Tx.